So when I was in the market for a new stroller many months ago I didn't have too many stipulations as to what I absolutely had to have in my stroller. What I knew for sure is I wanted a nice stroller that would grow with baby. I did not want to have to deal with a bulky stroller again at all. With the first two I had an Eddie Bauer stroller car seat duo and boy did we roll over a good amount of strange toes. Ha! I will admit that style was and has always been a factor. It was all about the car seat combo strollers when the first two were babies. So the search began. I hadn't been in the market for a stroller for a good eight years so I at the time was not aware of what the "go to" stroller was. As I began my search I literally stroller stalked every stroller that passed me by in the mall. Of course I saw many popular brands but the one stroller that I saw consistently was the UPPAbaby. Prior to these sightings I was not aware of the brand. 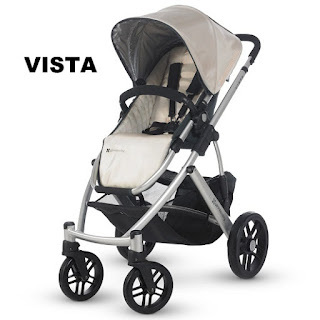 I had my heart set on the Orbit Baby system but in just one day of stroller stalking at the mall I noticed both the Cruz and a Vista models stroll by several times. Somewhat confused I noted the strollers in my phone and took it straight to Google to do some research as soon as I returned home. I was pretty impressed with the reviews that I'd read. However, I was still set on an Orbit Baby because it was definitely the coolest looking stroller and the swivel. I'm pretty sure that there is more to the Orbit stroller but at the moment that swivel was everything to me! Until I browsed a little further. I came across eye brow raising reviews regarding the Orbit Baby car set and after a few days decided that I'd go with the UPPAbaby brand. The next question was to compare the differences in the Cruz & Vista. What I learned is the Vista has bigger wheels, and a larger under carriage. I was not interested in the bassinet. I personally felt that the bassinet would be a waste for me simply because it is intended for newborns and I did not want to deal with everything that comes with maneuvering a newborn from car seat to bassinet. Other than the fact that it's trendy, it would only serve me a great purpose on neighborhood strolls. I then considered the baby stores and their size and thought about that one time I rolled straight over a ladies feet inside of the Carters store at Opry Mills mall in Nashville. I don't know about now but ten or so years ago that store was pretty tight on space! 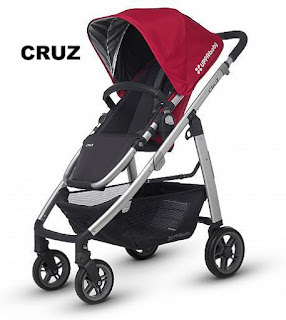 So with that in mind after a few more reviews I was set on the Cruz because the wheels are smaller and it is lighter in weight. I love all of the accessories that can be purchased to make the use of the UPPAbaby strollers a tad more conveinant. After a few uses I decided that I needed to purchase the UPPAbaby Parent Organizer and the UPPAbaby Carry All Parent Organizer because of my older two. They always needs me to carry something. I began to use the rumble seat when Aria reached six months or so. The final accessory that I purchased was the UPPAbaby Infant Snug seat. I purchased all on Amazon but these items can be found in Buy Buy Baby or you can find a retailer near you by going to the UPPAbaby site. The infant snug seat is a must if you plan to use the rumble seat before the toddler stages. You may have noticed that in the pictures above, Aria is facing me in the first picture and is facing forward in the second picture. This is what made me really love this stroller. At this age I prefer to keep her facing me. She is beginning to grow extremely curious so I at times face her forward when we aren't near large crowds. On another note, when she is sleeping I still prefer not to wake her. I decided that purchasing the Mesa car seat made a lot of sense so I have that as well. If Aria is still sleeping when we reach our destination I simply remove the car seat from the car and attach it to the stroller. All seats are detachable. The one thing that I strongly wish I'd done differently was to have purchased the Mesa seat in black. I purchased the color wheat and find that I have to clean it much more than I desire. I personally do not recommend purchasing the wheat color. As you may notice the canopy has a built in UV cover. It truly comes in handy on the bright and sunny days we often have here in Texas. There is also a pocket located on the canopy to provide ventilation at your discretion. This stroller also comes with a rain cover and mosquito net. I purchased my rumble seat in the Samantha color in 2016 and so far so good. Of course my car seat is utilized much more than the stroller. Another reason I do not recommend the wheat color! Also keep in mind that you will have to totally remove the rumble seat if it is facing towards you when folding. It will only fold flat if it's forward facing at the time and be careful not to allow the stroller to collapse solely on it's own. You will risk scratching the medal. Overall we love strolling in our UPPAbaby!